Veggie wraps are an ideal go-to when you can’t deal with cooking. They’re super quick to pull together, and perhaps best of all, take well to almost anything you have in your fridge. I try to include a good mix of fresh veggies, grains (or noodles) and a source of protein. And when it comes to the actual wrapper, the options are endless: rice paper, tortilla shells, greens — you name it, you can wrap it! Lately, my absolute favorite Crunchy Veggie Wraps have been ones that use collard green leaves as the wrapper. Collard greens are a naturally gluten-free alternative to wheat-based tortillas. 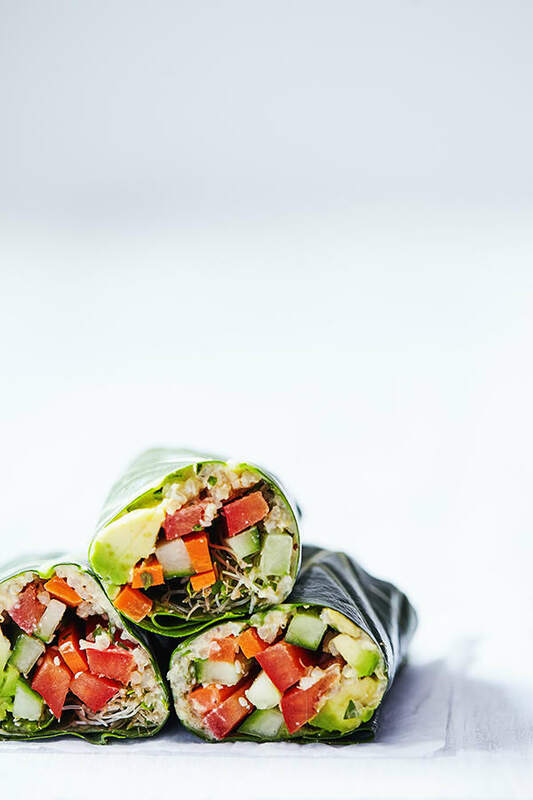 The recipe for Crunchy Veggie Wraps features a flavorful combination of lemony quinoa, crunchy veggies, and creamy avocado. Hummus and hemp seeds provide an extra boost of protein to keep you satisfied. Next, comes the fun part: You’ll want to have all your fillings laid out so that it’s as easy as loading them in, and giving the collard leaves a quick roll. 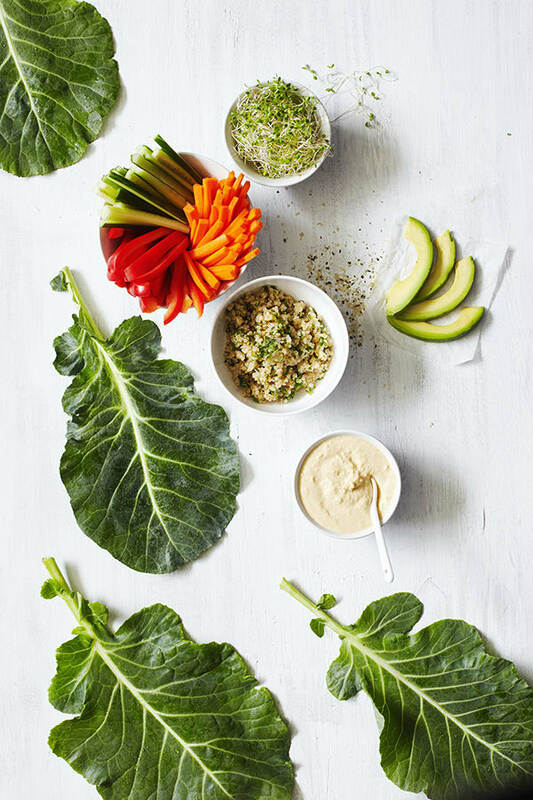 Just like burritos, you’ll want to place the filling near the center of the leaf, and be sure to roll the leaf as tightly as possible to keep all the fillings tucked in! One thing to note is that this recipe starts with cooked quinoa, so it’s handy to make a batch in advance. I love to cook up a big batch of grains at the beginning of the week, so I can easily toss them into salads or wraps throughout the week. 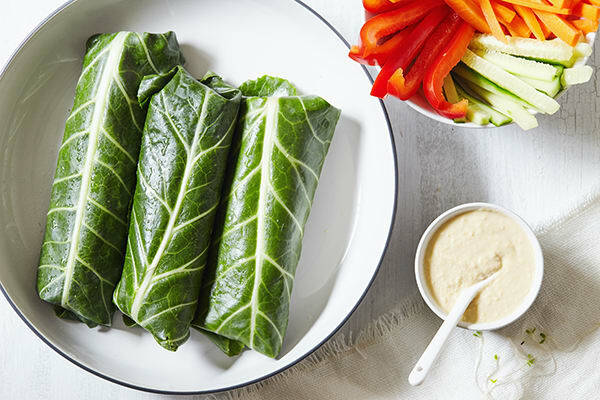 These veggie wraps made with collard greens and loaded with goodness, are an easy dinner when it's too hot to cook, and they're a perfect brown bag lunch. Use a vegetable peeler to make the collard green stems thinner. Start at the bottom of the leaf and peel up. Make sure you do not cut through the leaf. Set aside. Combine quinoa, parsley, lemon juice, and pepper in a small bowl; mix well. Set aside. Place leaves green side down on a cutting board or work surface. Evenly spread hummus in the center of each leaf. Top evenly with quinoa mixture, carrot, cucumber, bell pepper, microgreens, avocado, and hemp seeds. Fold long sides toward the middle and roll burrito style. Makes a great veggie and FFC as part of lunch.